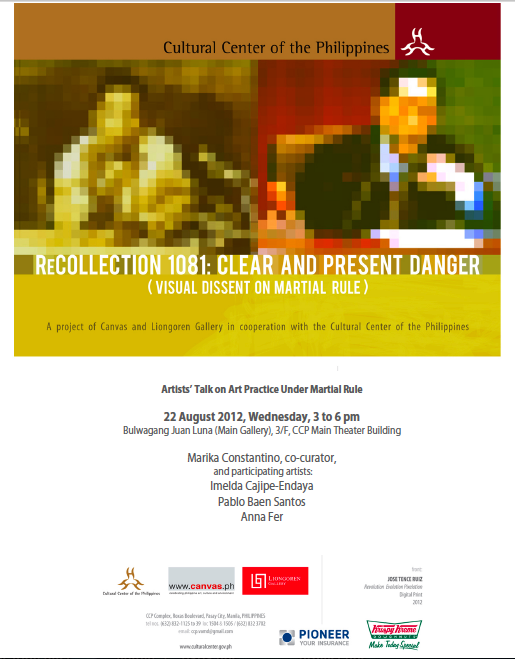 Everyone is invited to an Artists’ Talk on Art Practice Under Martial Rule entitled, "Recollection 1081: Clear and Present Danger" on 22 August 2012, Wednesday, 3-6 pm at Bulwagang Juan Luna (Main Gallery), 3/F of CCP Main Theater Building. Marika Constantino is the co-curator. Participating artists in the exhibit are Imelda Cajipe-Endaya, Pablo Baen Santos, and Anna Fer.